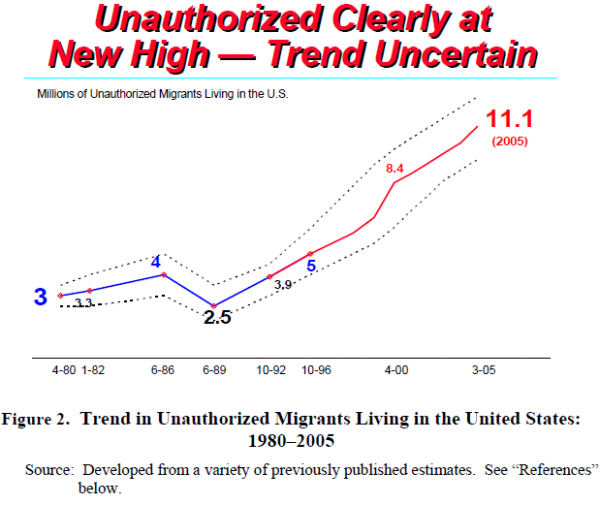 Size and Characteristics of the Unauthorized Migrant Population in the U.S. Neither the Census Bureau nor any other U.S. government agency counts the unauthorized migrant population or defines its demographic characteristics based on specific enumeration. The “residual method” is, however, a widely-accepted methodology for estimating the size and certain characteristics, such as age and national origins, of the undocumented population based on official data. This methodology essentially subtracts the estimated legal-immigrant population from the total foreign-born population and treats the residual as a source of data on the unauthorized migrant population (Passel, Van Hook, and Bean 2004). As of March 2005, there were an estimated 11.1 million unauthorized migrants living in the United States. A comparison to past estimates derived with the same methodology shows that the undocumented population has grown rapidly in recent years. 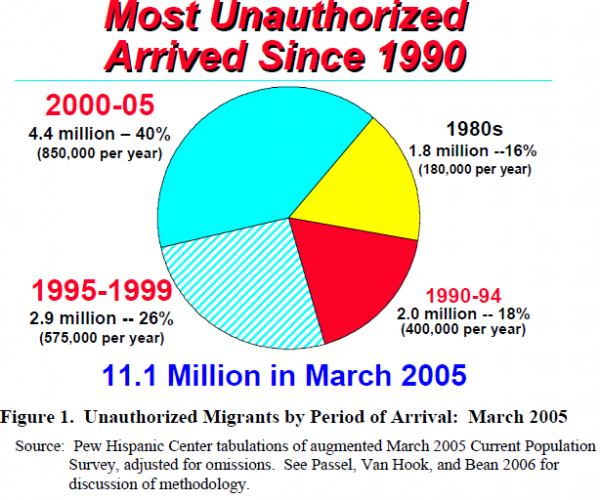 There were 8.4 million unauthorized migrants living in the United States in April 2000 according to estimates derived from Census 2000 (Passel, Van Hook, and Bean 2004). Thus, average annual growth over the 5-year period since 2000 was more than 500,000 per year. This number reflects the number of new unauthorized migrants arriving minus those who either die, return to their country of origin, or gain legal status. Data from the monthly Current Population Surveys conducted since March 2005, as well as other evidence such as the number of apprehensions by the Border Patrol, indicate that the unauthorized flow is continuing. Assuming that the rate of growth evident between Census 2000 and the March 2005 CPS held steady, the best estimate for March 2006 is between 11.5 million and 12 million for the current number of unauthorized migrants. More than 40% of the unauthorized population in 2005 or 4.4 million persons had been in the country since 2000 (Figure 1). Another 26% or 2.9 million people in the 2005 estimate arrived in the 5 years before that. Thus, about two-thirds of unauthorized migrants have been in the country less than 10 years. The March 2005 estimates are consistent with earlier findings which show that the pace of the unauthorized arrivals accelerated at the end of the 1990s and the early years of this decade (Passel and Suro 2005). Between 2000 and 2005 the number of new arrivals averaged 850,000 a year. Note that this number is higher than the annual net increase to the population because it only measures the number of unauthorized migrants being added to the population and does not subtract the number who either die, return home or gain legal status. 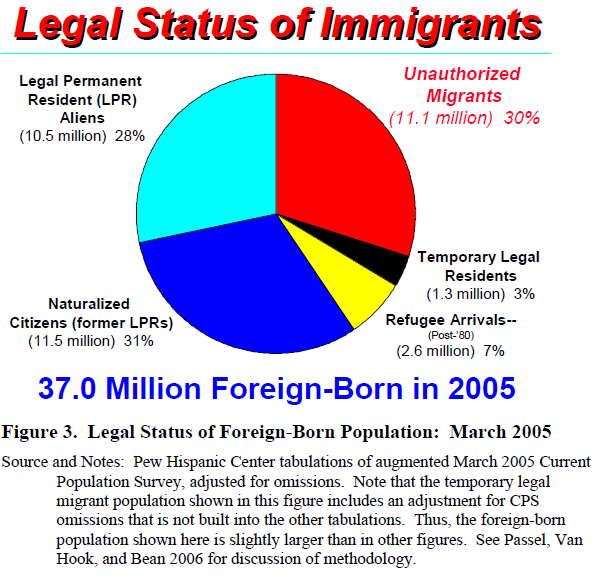 The foreign-born population totaled 37 million in the March 2005 estimates, including: 11.5 million naturalized citizens (31%), 10.5 million legal permanent resident (LPR) aliens (28%), 2.6 million refugees (7%) and 1.3 million temporary legal migrants such as students and temporary workers (3%). The rest of the foreign-born population 11.1 million or 30% are unauthorized migrants. Most unauthorized migrants come from Mexico. 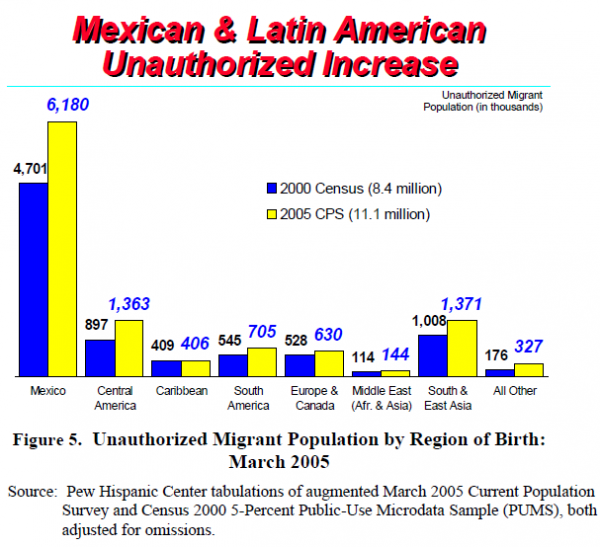 There were 6.2 million unauthorized migrants from Mexico in 2005, or 56% of the total, according to the CPS-based estimates (Figure 4). The Mexican-born population in the United States, including both legal and unauthorized migrants, has grown by about 500,000 people a year for the past decade. Of the Mexican migrants in the U.S. less than 10 years, the Pew Hispanic Center estimates that approximately 80 to 85% are unauthorized. About 2.5 million unauthorized migrants had come from the rest of Latin America in 2005, with most of those from Central America. 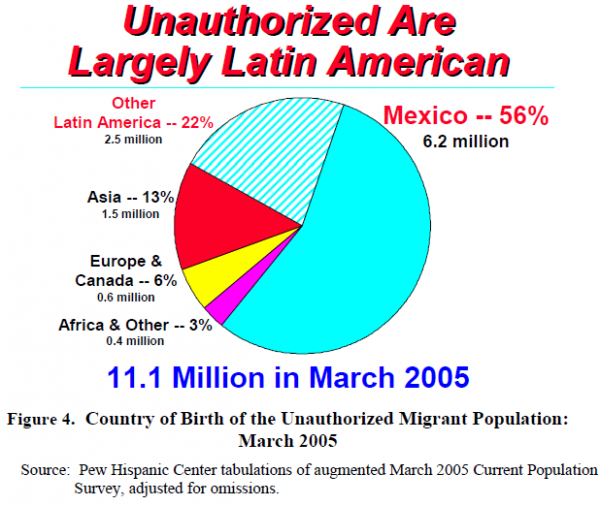 Taken together, unauthorized migrants from Mexico and Latin America represented 78% of the unauthorized population in 2005. There were about 1.5 million unauthorized migrants from the Asian continent in 2005, representing about 13% of the total. Europe and Canada accounted for 600,000, or 6%, and Africa and other countries for about 400,000, or 3%. While the shares from different regions have hardly changed in the last few years, between 2000 and 2005, the number of unauthorized Mexicans increased by 1.5 million, from 4.7 million to 6.2 million (Figure 5). During the same time period, the number of unauthorized migrants from Central America increased by 465,000, to 1.4 million; those from South and East Asia by 365,000, to 1.4 million; and those from South American by 160,000, to 705,000.